My clever friend Sue invited us over last week for a party with a motive so simple and compelling that it was positively brilliant: to eat pie. As you can see, people took the pie pot-luck directive very seriously. People brought their A-game. I contributed a savory tomato and zucchini pie (a recipe I’d share, but it needs some perfecting). My offering, however, was no match for the rhubarb beauty with ribbons of doughy latticework; a thick egg and kale quiche; the wild blueberry with a buttery crumble top; a delicate apple galette, a bacon, egg and onion dish or the layered coconut number that I sadly didn’t even have room for after sampling most of the others. It was an excellent way to spend the first official chill-in-the-air fall day here in New York, and I’ll be practicing my technique for the winter session. 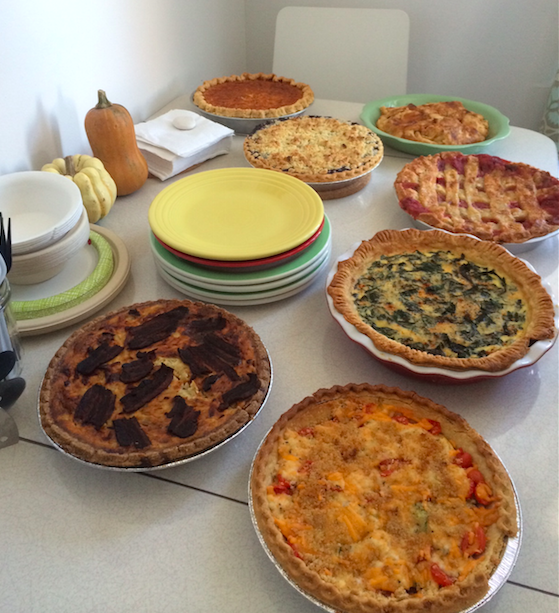 This entry was posted in create and tagged apple galette, coconut pie, cooking, pie, quiche, rhubarb pie by lhouse. Bookmark the permalink.